More than a third of Americans plan to shift their saving and investing strategies to accommodate for the holiday shopping season. With the National Retail Federation projecting $616.9 billion to be spent over November and December, it’s no wonder that more than one in three Americans will be adjusting their savings plans this holiday season to account for holiday spending. According to the Holiday Spending and Savings Study conducted by Edward Jones, 35% of Americans plan to shift their saving and investing strategies during the last few months of 2014 to accommodate for the holiday shopping season. “While Americans acknowledge the importance of sticking to financial goals, even those with the best intentions can get sidetracked this time of year,” said Scott Thoma, retirement strategist and principal at Edward Jones, in a statement. And, according to the study, women, millennials and lower-earning households are more likely to get sidetracked. The survey found that 18- to 24-year-olds are nearly twice as likely as those 65 or older to adjust their savings and spending strategy during the holidays (43% vs. 24%). Meanwhile, women were found to be more likely than men to make accommodations for increased year-end spending, with 40% of female participants planning on making a shift in their savings and investing strategies compared with 30% of their male counterparts. Moreover, women are also more likely than men (32% vs. 26%) to be most focused on holiday purchases. These findings weren’t entirely surprising to Brian Yarbrough, senior retail analyst at Edward Jones. “Women typically control household spending, so the response in our survey is in line with expectations,” said Yarbrough, in a statement. The study found that survey participants from the lowest earning households, those earning less than $35,000 per year, were most likely to adjust their plans, at 42%. Households with income levels between $50,000 and $75,000 were the least likely to adjust their plans, with only 26% indicating their plans to do so. The highest income earners, though, were no less likely than the survey average, 35%, to adjust savings plans. 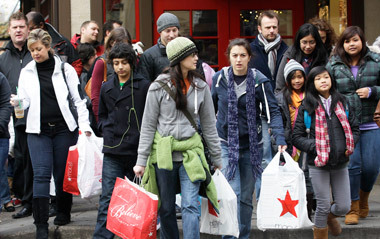 The study also found that 39% of Americans are preoccupied with paying off their debts during this time of year. Those between 45 and 54 years of age were found to be the most likely, at 46%, to focus on paying off debts compared with all age groups. Those that were more likely to stick to savings plans, the survey found, were respondents with household income levels greater than $100,000 – with 22% reporting to focus on making final contributions to savings and retirement plans during this time of year. The survey was based on 1,007 landline and cell phone interviews of U.S. adults conducted Oct. 2-5 by ORC International’s CARAVAN Omnibus Services.